In late 2015, Hasbro asked Transformers fans to choose from one of three massive classic characters to update for the modern age. Decepticon city Trypticon beat our Omega Supreme and Scorponok, and now we have our first look at the biggest official Decepticon toy ever. It pretty much had to be Trypticon, the only character of the three not to get a new version since his 1986 debut, despite being the go-to evil guy when a Transformers video game wants a mind-bogglingly huge villain to play with. 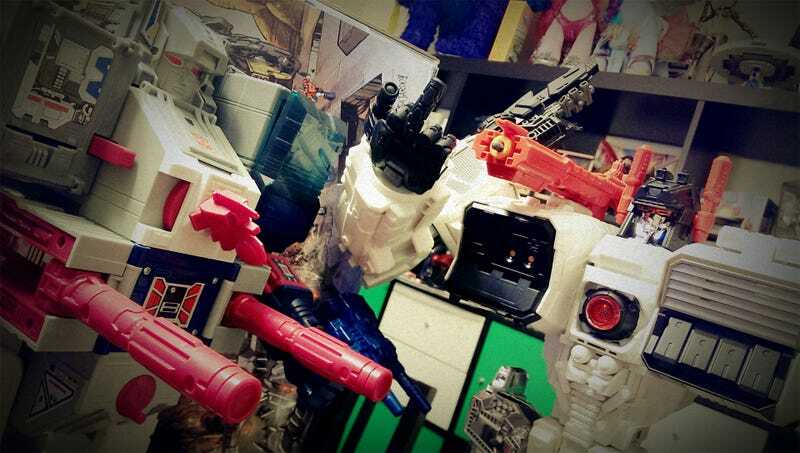 His Autobot counterpart, Metroplex, saw an alternate character with his name in the Unicron Triology of toys/cartoons, and was retooled by Hasbro into one of the biggest Autobots back in 2013. Hasbro didn’t give me specific dimensions, but assured me new Trypticon is the biggest Decepticon they’ve ever made. (Update 5:38pm— Hasbro gave me dimensions: 20 inches tall and 9 inches wide in Dino mode, and 36 inches wide, 30 inches long, and 16 inches tall in City mode). We get the same basic beats. The city tower backpack, the orange gem in the hips, the snout gun and those ineffectual little arms. He’s just much bigger and more detailed than ever before. Since the new figure is part of the Titans Return line, it features a gimmick that allows Trypticon to swallow tiny head robot figures, which can be retrieved in his stomach later. Here we see Tryps in city mode. Transformers has a different idea of what constitutes a city than humans, but it’s nice. Note that the figure also comes with a deluxe-sized Full-Tilt figure (the purple car), which attaches to the bigger robot’s chest in dino mode. Finally we have spaceship mode, which looks much cooler than I thought it would. The translucent green plastic helps a lot. 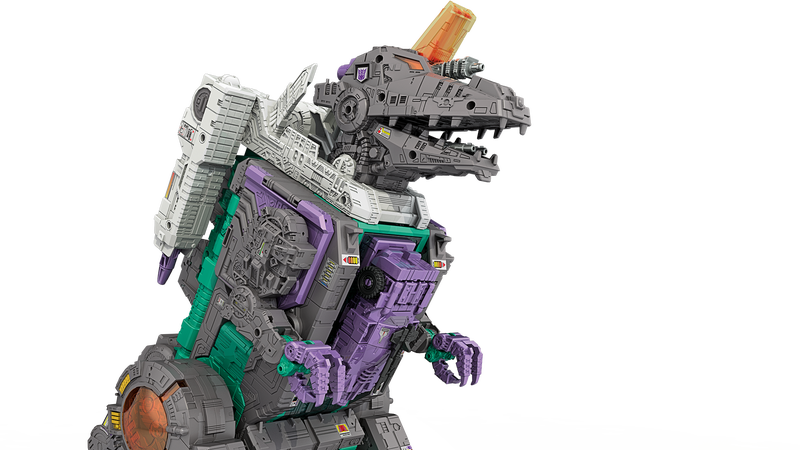 Trypticon will be available this fall for a suggested retail price of $149.99. I’ll be at Hasbro’s event during Toy Fair 2017 in NYC tomorrow, so I’ll be sure to get plenty of shots of this beast.